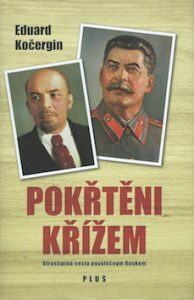 The czech translation of Eduard Kochergin’s novel CHRISTENED WITH CROSSES has been published by Albatros Media. It is a true story based on Kochergin’s life. While the mothers in Siberia wait for their soldier sons to return from the war in the west in 1945, the eight year old Eduard secretly jumps on board the trains heading in the opposite direction, heading west, towards Leningrad, escaping from orphan home to reunite with his mother.